My holiday house guests brought over a beast of a Panettone to celebrate New Year’s morning. Grateful to sleep in and not have to cook breakfast thanks to said Panettone, I was perhaps less so when we ate but a corner of it and the remainder sat on my kitchen counter like a carbohydrate coquette after my house guests left. I live alone, and carbs speak to me. Actually, they whisper huskily to me from the cupboards and I fall prey to their floury advances. The panettone purred: Mangiame, signorina. Sai che tu me desiderà! in a voice that sounded remarkably like Sophia Loren. Her having sat out on the counter for a few days, I did not care to partake, but hesitated to throw her away. Then a solution struck me that pleased my thrifty nature and rather titillated Sophia. I looked at this panettone and said: You, my dear, would make an excellent bread pudding. There is something so satisfying about slicing stars (no pun intended). The cubes then got a milk bath à la Cleopatra, absorbing the creamy liquid for an hour or so. This is what happens in my kitchen at sunset – it fills romantically with a golden, caramel-y glow. One of the ‘secret’ ingredients in my baking is my homemade vanilla sugar. Someone once gifted me with vanilla pods (whose seeds eagerly leaped their way into a crème brûlée, if I remember correctly) and the gift keeps on giving as the pods live a comfortable life in their Mason jar home, sweetly perfuming my white sugar, which I use in all my baking. The sugar is happily whisked into eggs (room temperature – always! You can immerse refrigerator cold eggs into warmish water baths to speed the process if your baking needs to happen NOW, which indicates where your priorities lie and makes me want to be your friend. Your cake/cookies/muffins, etc. will love you for this tempering. Otherwise your cold eggs will shock your batter and you will see tiny flecks and your batter will literally and figuratively lose its temper and rebel like a pouty teen, altering the texture of your baked good for the worse) and vanilla extract, combining to make an intensely vanilla-y custard-y goodness that is then added to the panettone cubes that by this time are drowsy drunk on milk. The view from my kitchen window at sunset: I may-or-may-not have paused my baking to dramatically stare at this for ten minutes half an hour. Nature really corners the market on beauty. Contentedly fat cranberries are folded into the mixture and I get really excited to eat the bursting, almost burnt ones. Yes, I do that - scavenge the pan for all the crispy bits like a cranberry-bent raven, or ‘craven’ as my word-combining enthusiast friend would say. Making something this rich even richer might be considered a sin, but I noticed this pudding was lacking in the (ahem - essential) butter area. Whisking together butter, confectioner’s sugar, and vanilla on a double boiler and beating in an egg till the whole thing cools down makes for a perfectly good reason to keep wearing holiday food forgiving leggings sauce to drizzle over slices of the pudding and broil till bubbly and oh-so heavenly. A 9x13 pan yields a lot of bread pudding. The richness of this dessert means a small portion packs a large hit of comforting yumminess and after one has eaten a cozy bowlful, one is left with a satisfyingly full feeling and pretty much the whole tray to share with friends, neighbours, the UPS delivery guy, your friendly neighbourhood water metre reader, etc. The residents of my apartment also thought eating bread pudding for breakfast was probably the best idea of the new year so far. The best part of living alone is making those kinds of executive decisions. Last week's French Toast was mighty jealous. Sure, this dessert might add to one’s curves, but I don’t think anyone ever had any issue with Sophia Loren’s. Cube the Panettone and place in a large bowl. Pour milk over cubes and let soak for ~ 1HR. Combine eggs, sugar & vanilla and add to soaked Panettone. Sprinkle with cinnamon. 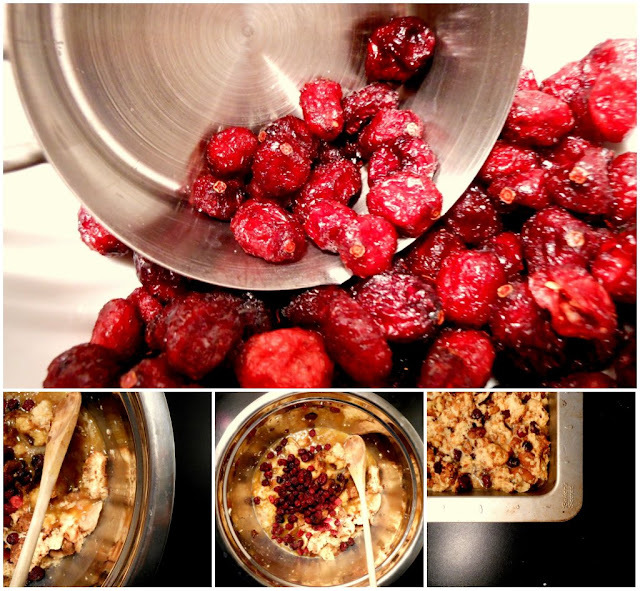 Gently fold in cranberries (or other dried fruit). The mixture should feel very spongy and make a ‘glurp’ sound when folding in the fruit. Place butter in a 9x13 pan and put in oven. Remove pan when butter is melted and browned slightly and use pastry brush or folded paper towel to distribute evenly all over bottom and sides of pan. Pour Panettone mixture into prepared pan and bake on centre rack of oven until set and golden brown on top ~ 1HR. Combine the butter and confectioner’s sugar together in the top of a double boiler, or a ceramic or metal bowl that fits on top of a pot with simmering water. Remove from heat when butter is melted and sugar has dissolved. Stir in vanilla or flavour-of-choice. Add beaten egg slowly and keep whisking the sauce until it has cooled to room temperature. Preheat broiler. Cut squares of the pudding (cooled to room temperature) and place in oven-proof serving dishes on top of a cookie sheet for simpler moving. Spoon sauce over individual squares and place under broiler until sauce is bubbling. Enjoy sans guilt. This tastes like cozy feels. Do it, Sarah! Not only are cranberries delicious, they are so prettily red that whatever you put them in can't help but look better too.